Is this the same Thrust that did "Thrust Concert" on C-64? The same Thrust that had Rob Hubbard? Actually it's a cracktro and i think it's real name is: "ottifanten"
ottifanten. idea taken right from otto - der neue film. a classic indeed. i think someone did that on c64 as well, which i found more enjoyable. anyway. toes up. deathy, that one was by stoat and tim. 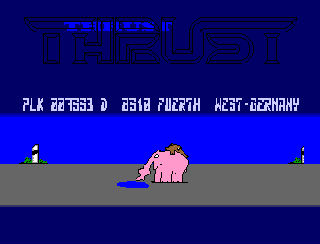 and they didn't call themselves thrust, it was just the demo that went by the same name as the tune by rob hubbard. Hitchhikr: Actually, the intro was used for several purposes. But yes, as everyone should know it's called Ottifanten. and now i remember the one from c64 - it was called 'mc gottifant' and it was released at horizon party in '90 or '91. i might still have it somewhere in my collection. hey great! this one! Thrust wanted to make the longest scrolltext ever... after that it was a competition for a time to make veryyyyyy long scrollers... but today they are all gone... the scrollers.. Thats really a classic! btw... I just read this scroller once.. and it was really damn long. Used to hold the scroller record for length, yes. Was used as the cracktro to Albedo, yes. The awesome tune to this nice intro was a contribution from Red Sector. It's a modification of Shannon "Let the music play". There has been a second part to this demo, which was released on a Thrust Copy Party Nürnberg back in the days. It was the picture of an Amiga 1000 showing the Ottifanten demo in a screen. Greetings from the Antitrax Posse. the origin of the pig! A very funny and enjoyable classic. added on the 2009-01-15 08:19:50 by ɧ4ɾɗվ. The little guy on the elephants back always had my sympathies. Great anim when it came out. we in germany still party everytime he pops up, while he´s above 60s already ! he´s just the number one when it comes to "FUN" !!! added on the 2009-01-15 12:16:27 by ɧ4ɾɗվ. A WHDLoad patch for this classic is now available. Worth mentioning is that the scrolltext here was protected with a checksum so no lamers could change it, in case someone tried to modify it the demo would reset the Amiga! rulez added on the 2014-12-05 11:17:42 by ɧ4ɾɗվ. page created in 0.017076 seconds with 15 queries.